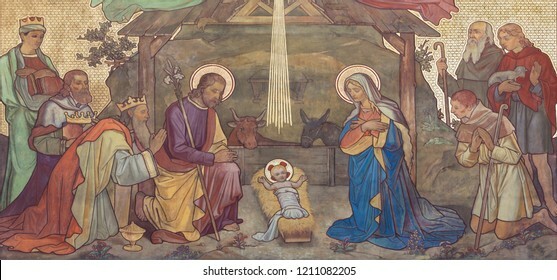 20,575 stock photos, vectors, and illustrations are available royalty-free. 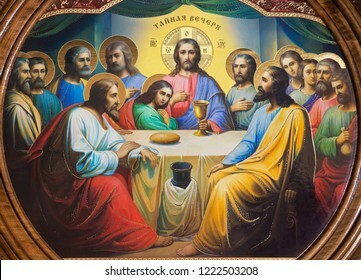 PRAGUE, CZECH REPUBLIC - OCTOBER 13, 2018: The paint of Last Supper on the side altar in church kostel Svatého Václava by unknown artist of 19. cent. 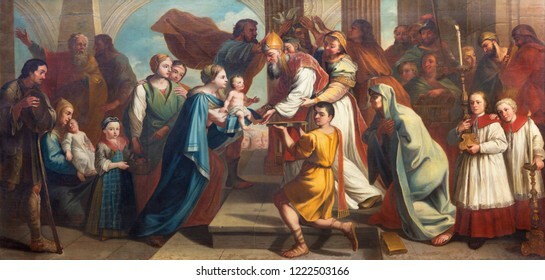 PRAGUE, CZECH REPUBLIC - OCTOBER 16, 2018: The painting of Presentation of Jesus in the Temple in church kostel Svatého Havla by unknown baroque artist. 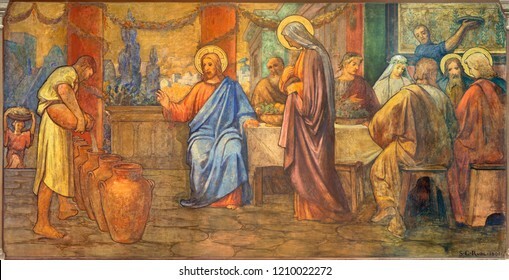 PRAGUE, CZECH REPUBLIC - OCTOBER 17, 2018: The fresco of The wedding at Cana in church kostel Svateho Cyrila Metodeje probably by Gustav Miksch and Antonin Krisan (19. 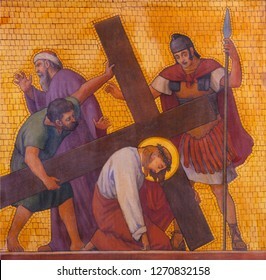 cent.). 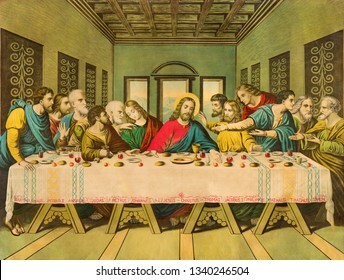 PRAGUE, CZECH REPUBLIC - OCTOBER 17, 2018: The paint of Last Supper church in Strahov monastery by unknown artist of 19. cent. 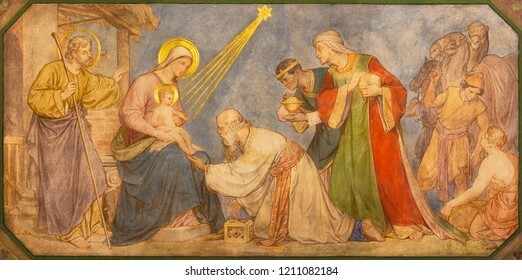 PARMA, ITALY - APRIL 16, 2018: The painting of Holy Family in church Chiesa di San Benetetto by unknown artist of 19. cent. 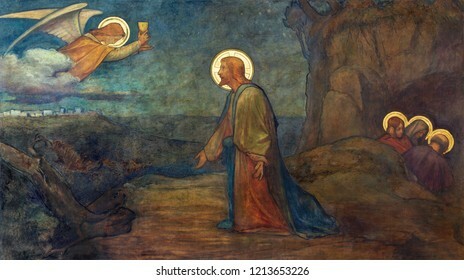 PRAGUE, CZECH REPUBLIC - OCTOBER 17, 2018: The conversion of st. Paul freso in the church kostel Svatého Cyrila Metodeje by S. G. Rudl (1896). 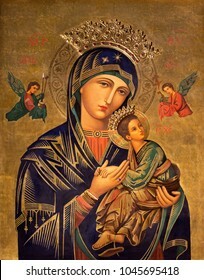 ZARAGOZA, SPAIN - MARCH 1, 2018: The painting of Madonna - Our Lady of Perpetual Help in church Iglesia del Perpetuo Socorro by pater Jesus Faus (1953 - 1959). 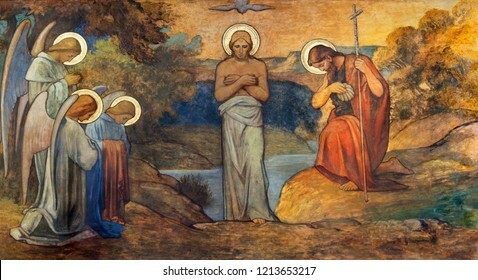 PRAGUE, CZECH REPUBLIC - OCTOBER 13, 2018: The fresco of Baptism of Jesus in church kostel Svatého Václava by S. G. Rudl (1900). 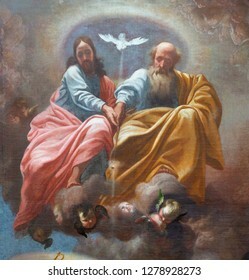 PRAGUE, CZECH REPUBLIC - OCTOBER 12, 2018: The baroque painting of Holy Trinity in church kostel Svatého Tomáše by Karel Škréta (1610 - 1674). 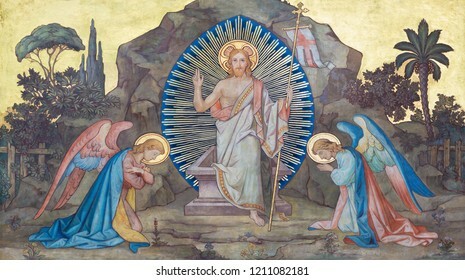 PRAGUE, CZECH REPUBLIC - OCTOBER 13, 2018: The fresco Resurrection of Jesus in church kostel Svatého Václava by S. G. Rudl (1900). 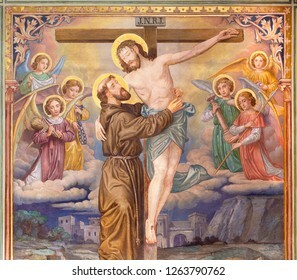 PRAGUE, CZECH REPUBLIC - OCTOBER 12, 2018: The symbolic idilic painting of St. Francis of Assisi and crucificted Jesus in church Bazilika svatého Petra a Pavla na Vyšehrade. 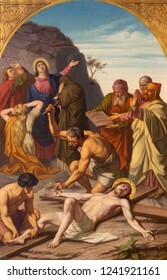 PRAGUE, CZECH REPUBLIC - OCTOBER 15, 2018: The painting of Burial of Jesus in church Bazilika svatého Petra a Pavla na Vyšehrade by František Čermák (1822 - 1884). 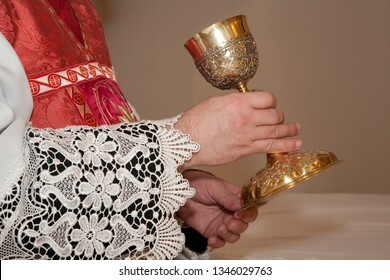 BOLOGNA, ITALY - APRIL 18, 2018: The paint of Virgin Mary of Guadalupe in chruch Chiesa di San Benedetto Francisco Antonio Vallejo (1772). 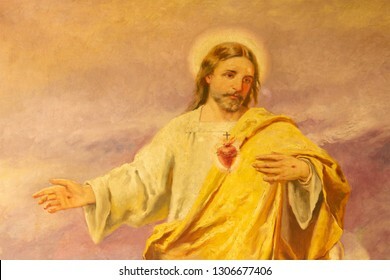 PALMA DE MALLORCA, SPAIN - JANUARY 29, 2019: The painting of Heart of Jesus in the Capuchin church. Dubai - The skyline of Downtown. 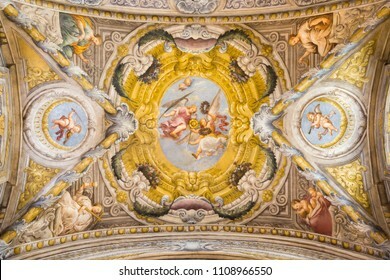 PARMA, ITALY - APRIL 16, 2018: The detail of fresco of Assumcion of Virgin Mary in cupola of Duomo by Antonio Allegri (Correggio - 1526-1530). 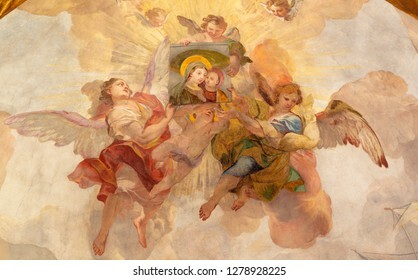 PRAGUE, CZECH REPUBLIC - OCTOBER 18, 2018: The fresco angels with the image of Madonna in church Kostel Svaté Kateřiny Alexandrijské by Václav Vavřinec Reiner (1689 - 1743). 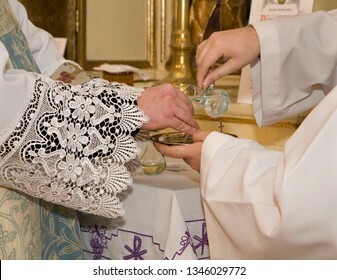 REGGIO EMILIA, ITALY - APRIL 12, 2018: The stone mosaic (Pietra Dura) with the Eucharist on the side altar in church Chiesa di Santo Stefano from 16. - 17. cent. 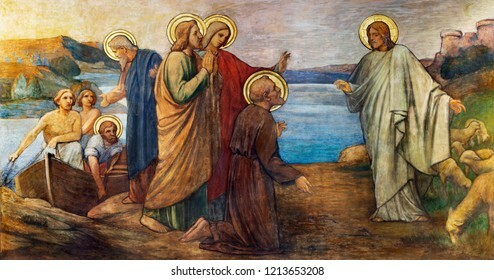 PRAGUE, CZECH REPUBLIC - OCTOBER 15, 2018: The fresco Paul's Farewell to Ephesian Elders in church Bazilika svatého Petra a Pavla na Vyšehrade by S. G. Rudl (1895). 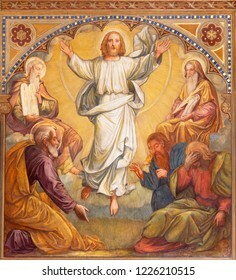 PRAGUE, CZECH REPUBLIC - OCTOBER 13, 2018: The fresco of Transfiguration of the Lord in church Bazilika svatého Petra a Pavla na Vyšehrade by S. G. Rudl (1895). 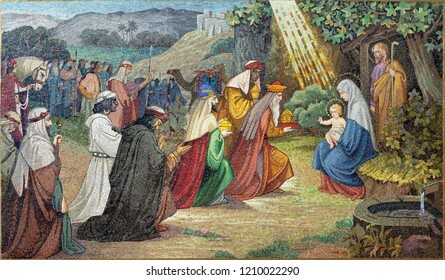 BRATISLAVA, SLOVAKIA, NOVEMBER - 11, 2017: Typical catholic image The Last Supper from end of 19. cent. 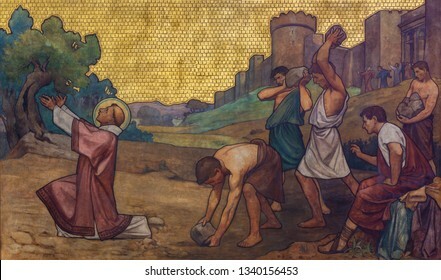 PRAGUE, CZECH REPUBLIC - OCTOBER 17, 2018: The stoning of St. Stephen freso in the church kostel Svatého Cyrila Metodeje by S. G. Rudl (1896). 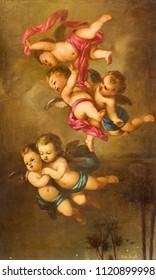 REGGIO EMILIA, ITALY - APRIL 12, 2018: The painting of angels in church Chiesa dei Cappuchini by Padre Angelico da Villarotta (1900 - 1987). 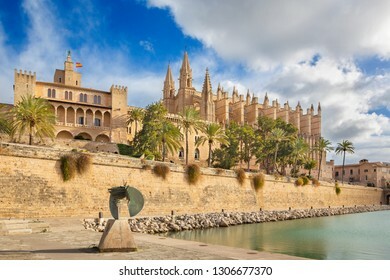 Palma de Mallorca - The cathedral La Seu and Almudaina palace. 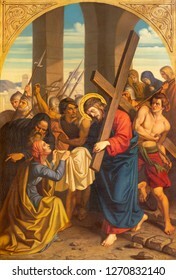 PRAGUE, CZECH REPUBLIC - OCTOBER 15, 2018: The painting Jesus is nailed to the cross (cross way station) in church Bazilika svatého Petra a Pavla na Vyšehrade by František Čermák (1822 - 1884). 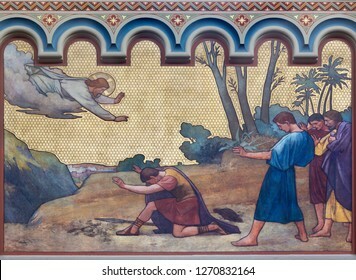 PRAGUE, CZECH REPUBLIC - OCTOBER 13, 2018: The fresco of Jesus in Gethsemane garden in church kostel Svatého Václava by S. G. Rudl (1900). 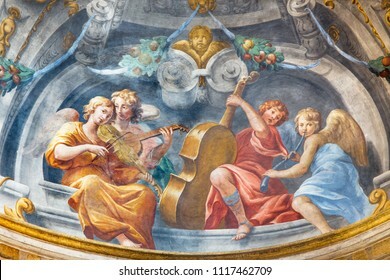 PARMA, ITALY - APRIL 15, 2018: The symbolic fresco of angels with the music instruments in church Chiesa di Santa Cristina by Filippo Maria Galletti (1636-1714). 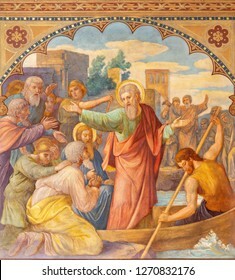 REGGIO EMILIA, ITALY - APRIL 12, 2018: The fresco glory of holy Prospero in church Basilica di San Prospero by C. Manicardi, G. Ferrari and A. Lugli (1884-1885). 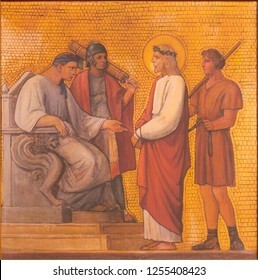 PRAGUE, CZECH REPUBLIC - OCTOBER 17, 2018: The painting of Jesus judgment for Pilate in the church kostel Svatého Cyrila Metodeje by S. G. Rudl (1935). 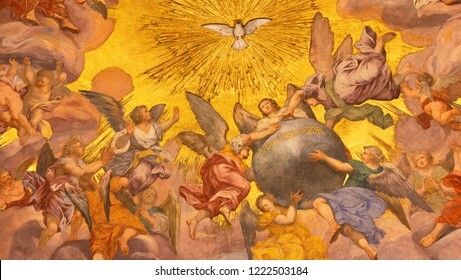 PRAGUE, CZECH REPUBLIC - OCTOBER 18, 2018: The baroque fresco of Creation in church kostel Svaté Voršily by Jan Jakub Stevens ze Steinfelsu (1707). 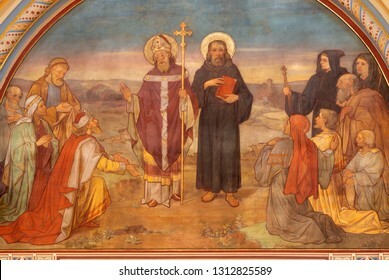 PRAGUE, CZECH REPUBLIC - OCTOBER 12, 2018: The painting St. Francis in church Bazilika svatého Petra a Pavla na Vyšehrade by S. G. Rudl (1895). 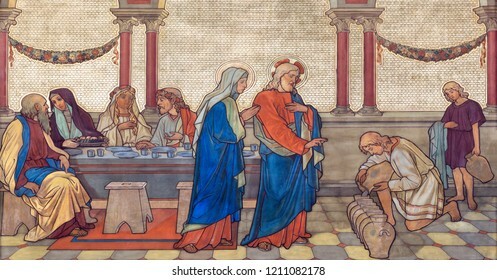 PRAGUE, CZECH REPUBLIC - OCTOBER 17, 2018: The painting Jesus meets the women of Jerusalem in the church kostel Svatého Cyrila Metodeje by S. G. Rudl (1935). 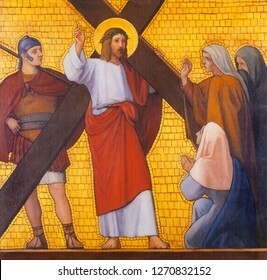 PRAGUE, CZECH REPUBLIC - OCTOBER 17, 2018: The painting Jesus fall under the cross in the church kostel Svatého Cyrila Metodeje by S. G. Rudl (1935). 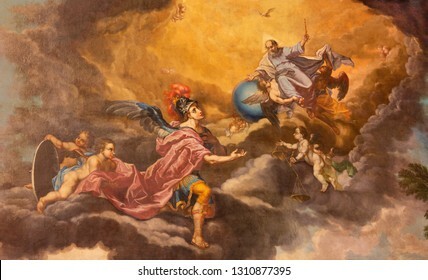 ZARAGOZA, SPAIN - MARCH 2, 2018: The painting of Michael Archangel in church Iglesia de la Exaltación de la Santa Cruz by Manuel Eraso (after Guido Reni in Rome) from 18. cent. 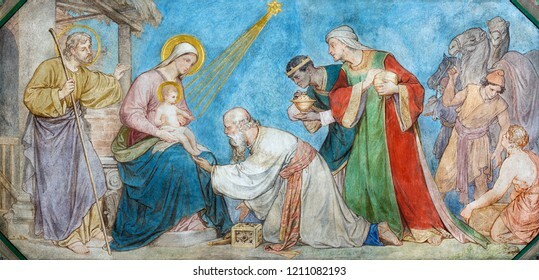 PRAGUE, CZECH REPUBLIC - OCTOBER 17, 2018: The fresco of Adoration of Magi the in church kostel Svatého Cyrila Metodeje by Petr Maixner (1872). 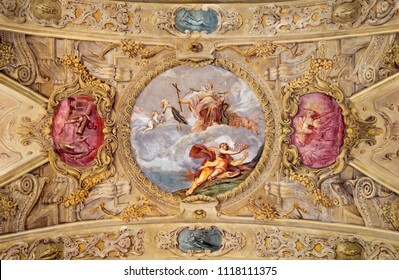 PARMA, ITALY - APRIL 16, 2018: The ceiling fresco of Triumph of Religion - Trionfo della Religione in church Chiesa di San Vitale by Giuseppe Peroni (1760 - 1763). 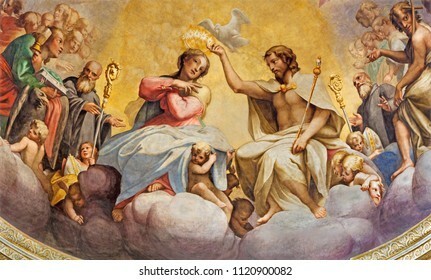 PARMA, ITALY - APRIL 15, 2018: The fresco of Coronation of Virgin Mary in main apse of church Chiesa di San Giovanni Evangelista by Cesare Aretusi (1587). 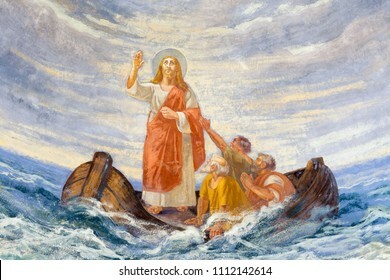 REGGIO EMILIA, ITALY - APRIL 12, 2018: The modern fresco Jesus Calms the Storm in church Chiesa di San Agostino from 20. cent. 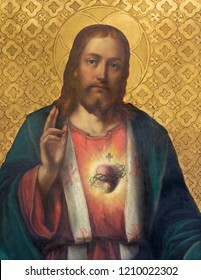 MODENA, ITALY - APRIL 14, 2018: The painting of Heart of Jesus Christ in church Chiesa di San Bartolomeo from 20. cent. 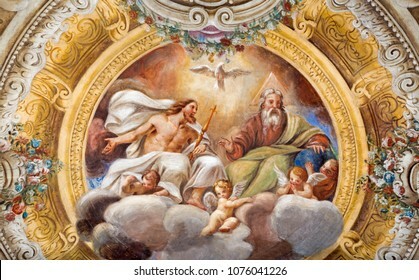 PRAGUE, CZECH REPUBLIC - OCTOBER 17, 2018: The fresco of Saint Cyril and Methodius in church Svatého Cyrila Metodeje by František Sequens from end of 19. cent. 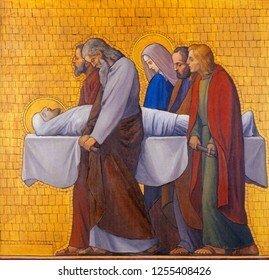 PRAGUE, CZECH REPUBLIC - OCTOBER 17, 2018: The painting of Burial of Jesus (cross way station) in the church kostel Svatého Cyrila Metodeje by S. G. Rudl (1935). 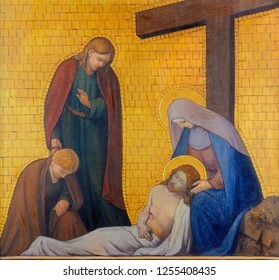 PRAGUE, CZECH REPUBLIC - OCTOBER 17, 2018: The painting of Deposition or Pieta (cross way station) in the church kostel Svatého Cyrila Metodeje by S. G. Rudl (1935). 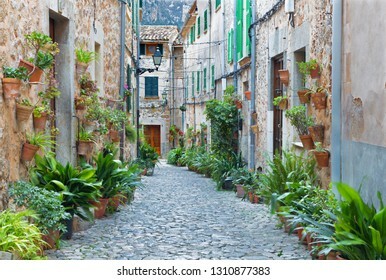 VALDEMOSSA, SPAIN - JANUARY 28, 2019: The old aisles of Valldemossa village. 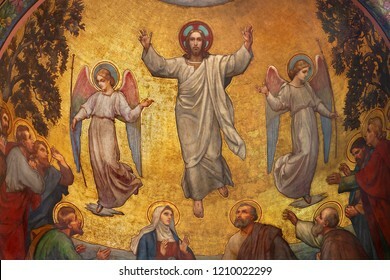 PRAGUE, CZECH REPUBLIC - OCTOBER 13, 2018: The fresco of Ascension of Jesus in side apse of church kostel Svatého Václava by S. G. Rudl (1900). 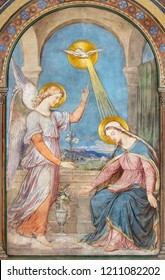 PRAGUE, CZECH REPUBLIC - OCTOBER 17, 2018: The fresco of Annunciation in the church kostel Svatého Cyrila Metodeje by Petr Maixner (1872). 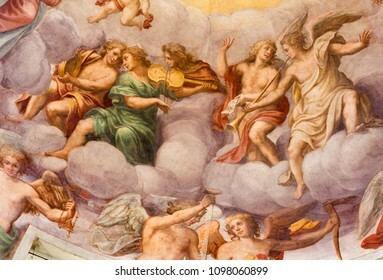 PARMA, ITALY - APRIL 16, 2018: The freso of angels with the music intstruments in the cupola of church Chiesa di Santa Croce by Giovanni Maria Conti della Camera (1614 - 1670). 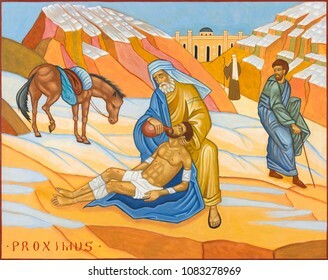 BOLOGNA, ITALY - APRIL 18, 2018: The icon of Parable of the Good Samaritan in church Chiesa di San Pietro by Giovanni Paolo Bardini. 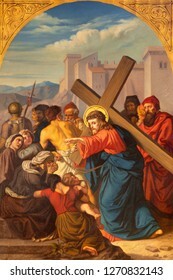 PRAGUE, CZECH REPUBLIC - OCTOBER 15, 2018: The painting of Fall of Jesus under the cross in church Bazilika svatého Petra a Pavla na Vyšehrade by František Čermák (1822 - 1884). 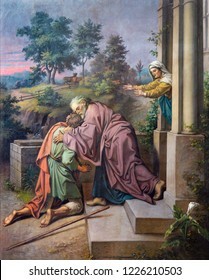 PRAGUE, CZECH REPUBLIC - OCTOBER 15, 2018: The painting Veronica wipes the face of Jesus in church Bazilika svatého Petra a Pavla na Vyšehrade by František Čermák (1822 - 1884). 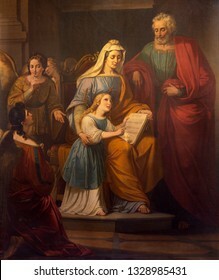 PRAGUE, CZECH REPUBLIC - OCTOBER 15, 2018: The painting Jesus meets the women of Jerusalem in church Bazilika svatého Petra a Pavla na Vyšehrade by František Čermák (1822 - 1884). 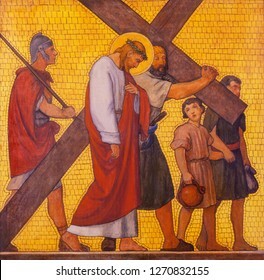 PRAGUE, CZECH REPUBLIC - OCTOBER 17, 2018: The painting Simon of Cyrene helps Jesus carry the cross in the church kostel Svatého Cyrila Metodeje by S. G. Rudl (1935). 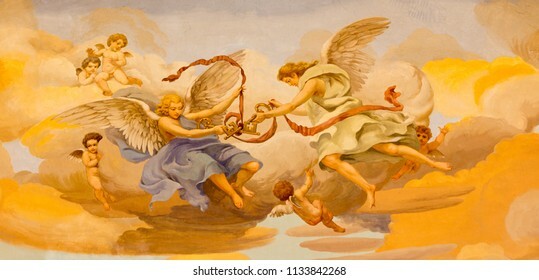 PRAGUE, CZECH REPUBLIC - OCTOBER 18, 2018: The baroque fresco of Angels with the Holy Spirit in church kostel Svaté Voršily by Jan Jakub Stevens ze Steinfelsu (1707). Dubai - The evening Marina towers from the promenade of Palm Island. 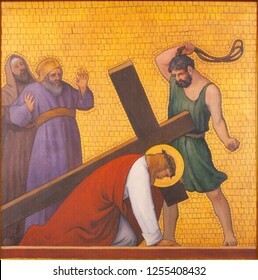 MODENA, ITALY - APRIL 14, 2018: The baroque painting on the wood (altar) with the martyrdom of St. Sebastian symbols in church Chiesa di Santa Maria della Pomposa. 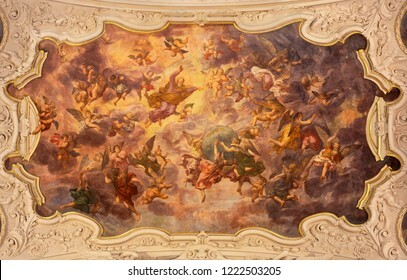 PRAGUE, CZECH REPUBLIC - OCTOBER 18, 2018: The ceiling frescoes from live of Virgin mary in church Bazilika Svatého Jakuba Většího (James the Greater) by František Voget (1736). 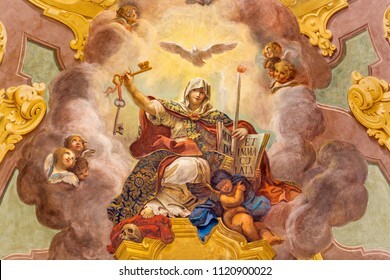 PRAGUE, CZECH REPUBLIC - OCTOBER 16, 2018: The painting of Presentation of Virgin Mary in the Temple in church kostel Svatého Havla by unknown baroque artist. 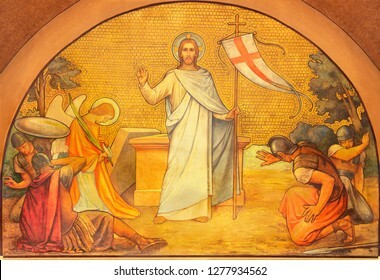 MODENA, ITALY - APRIL 14, 2018: The stone floral mosaic (Pietra Dura) with the in church Chiesa di Santa Maria della Pomposa from 17. cent. 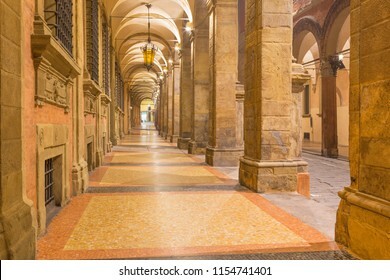 Bologna - The porticoes of old town in the morning. 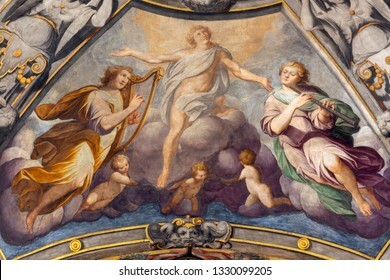 PARMA, ITALY - APRIL 17, 2018: The fresco of angels with the symbols of the martyrdom on the wault of church Chiesa di Santa Lucia by Alessandro Baratta from 17. cent. MODENA, ITALY - APRIL 14, 2018: The stone floral mosaic (Pietra Dura) on the side altar in church Chiesa di San Bartolomeo from 16. - 17. cent. 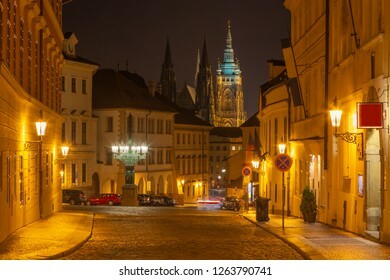 Prague - The St. Vitus cathedral and the Loretánská street at night. 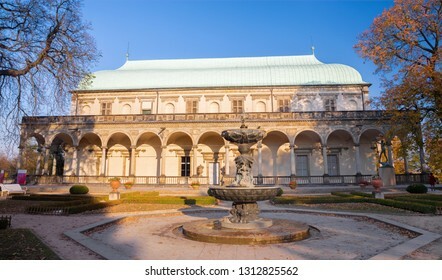 FLORENCE, ITALY - MARCH 17, 2010: The statue of astronomer Galileo Galilei on the facade of Uffizi gallery by Aristodemo Costoli (1803 – 1871). 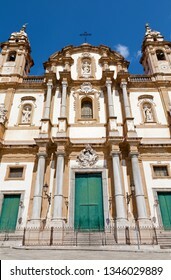 Palermo - San Domenico - Saint Dominic baroque church. 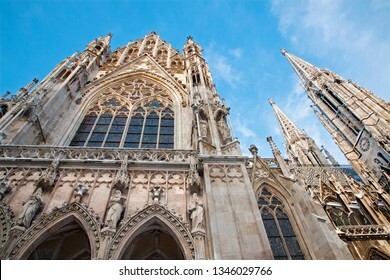 Vienna - The Votivkirche neo - gothic church from south. 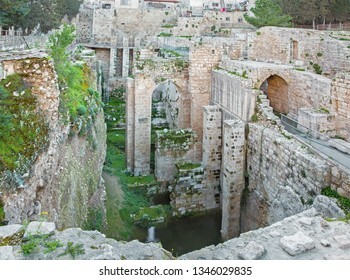 Jerusalem - The ruins of Bethesda pool. 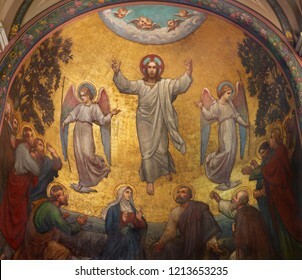 MODENA, ITALY - APRIL 14, 2018: The stone floral mosaic (Pietra Dura) with the St. Francis of Assisi at the prayer in church Chiesa di Santa Maria della Pomposa by Giovanni Pozzoli (1646-1734). 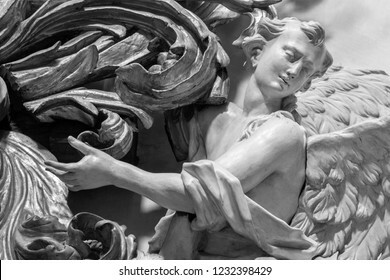 PRAGUE, CZECH REPUBLIC - OCTOBER 12, 2018: The carved polychrome baroque statue of angel from the side altar in St. Francis of Assisi church by M. V. Jäckel a J. K. Liška. 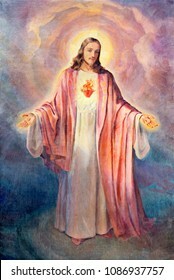 (17. 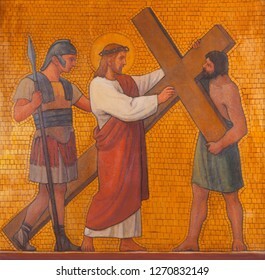 - 18. 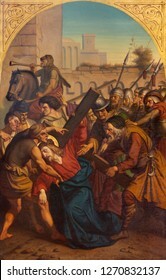 cent.). 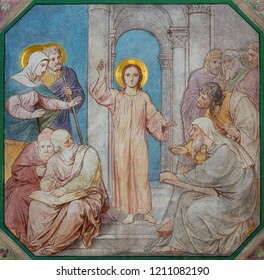 PRAGUE, CZECH REPUBLIC - OCTOBER 17, 2018: The fresco of Twelve old Jesus in the Temple in church kostel Svatého Cyrila Metodeje by Petr Maixner (1872). 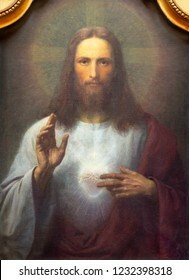 PRAGUE, CZECH REPUBLIC - OCTOBER 13, 2018: The painting of Heart of Jesus church kostel Svatého Václava by unknown artist of 19. cent. 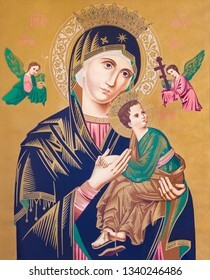 SEBECHLEBY, SLOVAKIA - FEBRUARY 26, 2016: Typical catholic image of Madonna with the child (Our Lady of Perpetual Help) from the end of 19. cent. 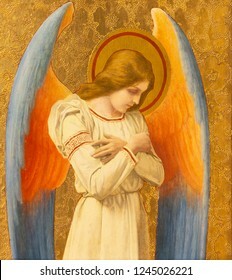 originally by unknown painter. 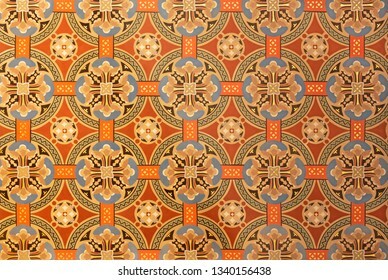 PRAGUE, CZECH REPUBLIC - OCTOBER 17, 2018: The detail of decoration in church Svatého Cyrila Metodeje. 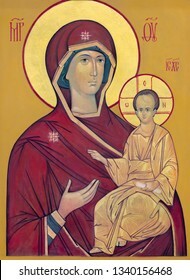 PRAGUE, CZECH REPUBLIC - OCTOBER 18, 2018: The icon of Madonna - Mother of God in church kostel Svaté Kateřiny Alexandrijské. 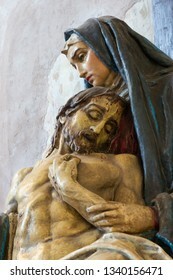 PRAGUE, CZECH REPUBLIC - OCTOBER 14, 2018: The detail of the statue of Pieta in church of St. Egidius (Jiljí) by unknown artist. 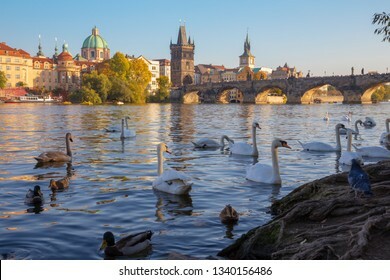 Prague - The Charles bridge and the swans on the Vltava river. 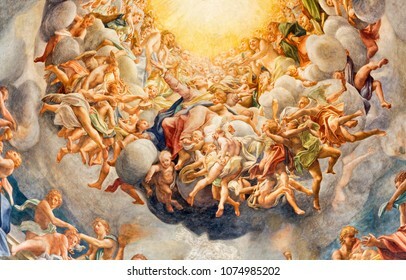 PARMA, ITALY - APRIL 16, 2018: The fresco of Transfiguration on the mount Tabor in Duomo by Lattanzio Gambara (1567 - 1573). 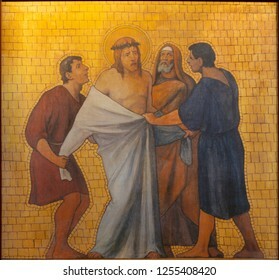 PRAGUE, CZECH REPUBLIC - OCTOBER 17, 2018: The painting Jesus clothes are taken away in the church kostel Svatého Cyrila Metodeje by S. G. Rudl (1935).